Here’s how to kick off Monday mornings with a moneysaving breakfast deal. 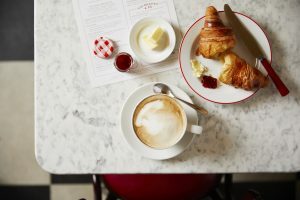 The folks at Cafe Rouge are are dishing up breakfast every Monday during January at 1989 prices as part of its 30th anniversary celebrations. So that means you can get a hot drink and pastry for £2 a time; saving around 50% on today’s prices. Hot drinks include coffee, tea and hot chocolate and you get a choice of pastries including a croissant, almond pastry, pain au chocolat or pain aux raisins all at retro prices. Download your voucher here to bag your half price breakfast. And while right now it doesn’t say so on the website, the Cafe Rouge press team tell me the deal’s also going to run every day during the working week kicking off from 21st January. ← Win your dinner for free!